In February 2017 our IBC patient advocates attended the IBC Symposium at M.D. Anderson Cancer Hospital in Houston, Texas where our researcher Dr. Fedor Berditchevski presented his work 'Tetraspanins and the tumour microenvironment'. For more information please visit the Berditchevski Lab website (http://berditchevski-lab.weebly.com/). 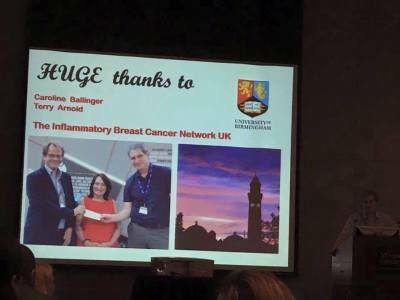 We have teamed up with Birmingham University School of Cancer Sciences to aid them in their research into inflammatory breast cancer. This is in the exciting new and promising field of immunotherapy. 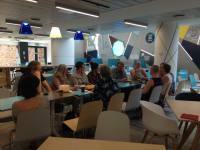 The women in our support group have donated blood samples, answered questionnaires and one day soon hope to donate their biopsy samples for their research labs. 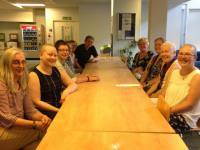 ​In August 2016 members of our support groups were given a fascinating tour of the laboratories and tissue bank at Birmingham University School of Cancer Sciences. 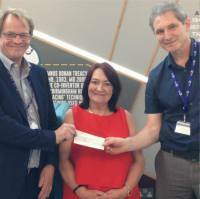 We were also delighted to hand over a cheque for £25,000 towards inflammatory breast cancer research that is taking place there. We have already started fundraising for this research into immunotherapy in IBC to continue so please keep us in your thoughts.